Toe to Heel Inside- 9 1/8 inches When measuring for size, measure the inside of a shoe you wear not your foot. this gives a more accurate measurement. allow for the curvature of the arch. 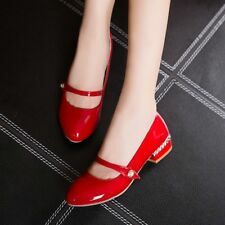 These cute shoes are unique. Comfortable and versatile. Leather and suede upper, with rubber soles. Clark Artisan Brown Leather Shoes: Elastic Mary Jane strap, padded leather fabric foot bed, wedge style heel. Quality shoes made in Brazil. Barely worn. Clean Polished Ready to Wear. The shoes size reads 7.5". Adjustable mary jane strap. Taupe leather upper. Soft leather lining. Padded leather footbed. SIZE 7 WIDE. Wos Shoes Mary Jane. Black Leather Walking Exercise. 1.5" heels. These are quality walking shoes by KEEN. Need I say more, for QUALITY. Their shoes are distributed worldwide. These shoes have great rubber traction soles and are very comfortable. SZ 6M They are black leather with white stitching. Up for your consideration is apair of Ladies Black Leather Clarks Artisan Mary Jane Casual Shoes size 9.5 M. These are in excellent pre-owned condition. They have minor wear on out soles. Inside clean, no odor. Wos Shoes Mary Jane PLAZA MJ. Black Suede Leather Buckle. Heel Type: WEDGE. Color: BEIGE. Materials: LEATHER. SHOES HTML Code. Pattern : SOLID. Size - 7M. Color - Bronze Brown. SEE PICTURES FOR VISUAL CONDITION & CONDITION OF SOLE (USE ZOOM). No defects noted slight wear on sole. Mint Condition! Durable rubber outsole. Size 5.5M. 100% Authentic. Hidden wedge for added height. I will try my best to correct the problem. Style W0807-B. Heel Height. Material Leather. Arcopedico Elio Parodi Red Wms Sz 37 Wedge Pumps Mary Janes Portugal Ships Fast! Designer: Born. Content: Leather upper, balance man-made materials. Color: Black. Wos Mary Janes. Alegria PG Lite. FOR SALE IS A PAIR OF PALLADIUM SHOES. 1.25" HIGH COVERED HEEL. BROWN CROC PRINT LEATHER UPPER. SOFT LEATHER LINING. RUBBER SOLE. The only sign of wear is a scuff on the toe of the left shoe. (last picture) They are clean and very comfortable. Great shoes if you are on your feet a lot. Full-Grain Leather. Soft, cushioned, textured footbed. Clean, gently used. No obvious defects or flaws. Great condition. Antonio Melani 9 Beautiful Shoes Dark Brown and Tan. These shoes are in Excellent condition and very interesting looking. Very nice pair of slip on slip-on Mary Jane Style loafers by Clarks in size 7, color Black. You are purchasing a pair of New Balance Cobb Hill Rev Lite Mary Janes Back Strap Red Leather 1" Heel Sz 10M. Better Life Sales. worn down soles and other imperfections. Condition : Most used shoes, boots, sandals, etc will typically have wear such as scuffs, scratches. Content: Leather upper, balance man-made materials. Color: Brown. Size: 6.5M. These are a pair of mary jane style shoes made by Born. TRUFFLES White Leather Mary Janes. Mary Jane T-Strap with adjustable buckle. >>> F E E D B A C K <<<. >>> T E R M S O F S A L E <<<. I will do my best to provide the best service and the best price. Traditional Mary Jane black heals. Heel is low about 1.5”. 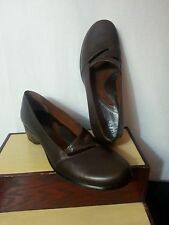 Very nice pair of slip on slip-on Velcro strap loafers by Clarks in size 6.5, color Brown. Condition is excellent. I will not list an item that is visibly dirty. I try to give a great deal for your money. Fastening: Slip On. Heel Type: Block. Heel Height: 1.75in. Materials: Leather and Man Made. Color: Black. Leather upper - leather lining- leather padded footbed - button strap - comfort arch support - cork - rubber out soles. PRE-OWNED GREAT CONDITION.Very nice and comfortable shoes. WHAT YOU SEE IS WHAT YOU GET. Very cute Genuine leather Lauren Ralph lauren shoes size 8. SPRING STEP DEMITRIA - WOMEN’S BLACK LEATHER MARY JANE WEDGE - SIZE 9B!